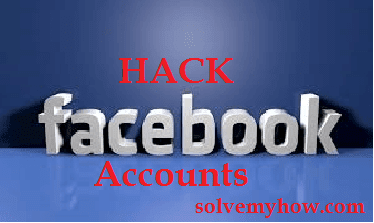 How to hack facebook accounts ? After the invention of Facebook, hacking has become the hobby for people. Today everybody wanted to be a hacker and wanted to learn how to hack something. But hacking really requires programming and networking skills. But if you wanted to hack Facebook account then, this can be done by using some tricks and this is what we gonna see in this post. This trick doesn't requires any programming skills. You just have to follow simple steps written below. So, do you want to hack Facebook accounts of other people ? If yes then let's Quickly start !!! Now, there are various techniques to hack anyone's Facebook account and the one of them is called Phishing page technique. While for the rest of the techniques, I'll write soon in my upcoming posts. Phishing is the most well known and most widely used hacking technique. It is used to hack anyone's Username and Password by making fake login pages. In this Technique we will create the similar looking page of any website which we wanted to hack. Here we are going to make similar looking page of Facebook. You can also create phishing pages of yahoomail , gmail, skype etc or you can simply ask me through comments and I'll give you the Phishing page of those website . This is the simplest hacking trick to hack anyone's Username and Password as no hacking tools / software's are required for it. Anyone who have basic knowledge of internet, can learn how to hack facebook account. In this trick victim gets fooled by looking at the phishing page and simply enter his or her username and password and it will be stored to your Database. Step 1 :- First you need to create account on any Free Web Hosting Website to host your Phisher page on the web. There are many website which provide Free Web Hosting Service upto Certain GB's. The Website like :- 000webhost, byethost, t35, freehostia, 110mb, 0fees, biz, wix etc. I've made account on 000webhost. you can make free account by clicking on Sign up and Log-in in by clicking Members area. for example :- In my case they gave me solvemyhow.host56.com. So, you can see these type of domain's doesn't look so good and also they are pretty hard to remember . So, You can also get the free Domain from the below link. Step 3 :- Now, login into your free hosting website's account and change it with your domain. The Snap shot is of 000webhost.com . You can change your Domain name inside C-Panel and in that Parked Domains Option as show in the above snap shot. Note :- Skip Step 3, if you've Skipped Step 2. Step 4 :- Now, go to File Manager you'll find that Option inside the C-Panel. here you've to upload Facebook Phisher Page. First Download it from HERE and extract it ! Now, just go into File Manager inside that you'll find Pulic_html Folder inside that you will get default.php file which you have to delete and upload the files which you have just downloaded. If you won't delete default.php file you'll will get error though you have Uploaded your files. 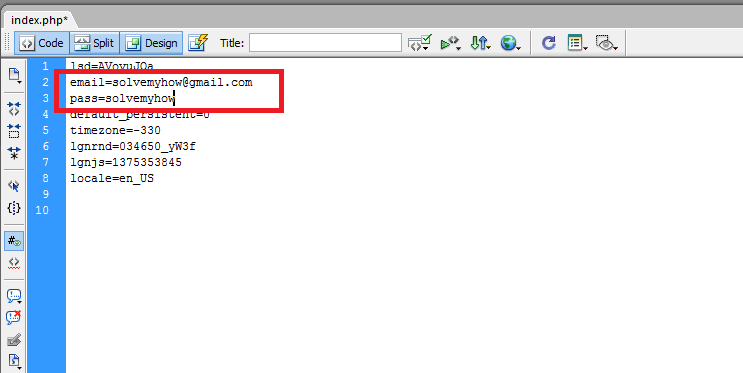 So, just select it and delete it and upload the Files of Facebook Phisher Page in the same Folder Called Public_html. Step 5 :- Your Fake Facebook page is online now. You just have to share it on various Social Media sites as if people visit there and tries login into Facebook from that Page. Now can you say that the above snap-shot is of Fake Facebook Page or Facebook Phisher Page. Here when the User after inserting his/her Username and Password Hit Login the Script will save credential of User into your log.txt file. Step 6 :- In the above step user has just entered his or her Username and Password which is already stored into your database and user can't come to know any day that you have Hacked his Facebook account. Now again Login into Free Hosting Website's account and visit where you have uploaded the File of Facebook Phisher Page. In that you'll find one file Called log.txt which I've made for Storing Username and Password. 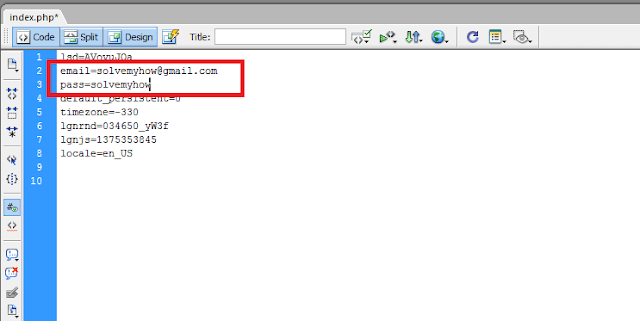 Just Click on that file i.e log.txt and you can View the Stolen/Hacked Username and Password's of Victim's. That's it the Hacking has been done. Now, you know your Friend's Username and Password and you can Simply login into there Facebook account's . So How To Get Protected ? Though we're using Internet Since long we made the Common Mistakes as we're not looking for the URL's. Firstly Look for Official URL's Like For Facebook It should be only facebook.com and if some hacker is very very smart and found the very similar Domain or made very similar URL of Facebook. Then secondly you need to watch the Color of https:\\ . It Must be Green for Valid Sites. The above Snap shot is of official facebook. Firstly Look at the URL and secondly Look at the Color of https:\\ its Green. So, its the Official Website of Facebook. So, this was all about how to hack Facebook account using phishing technique. Hope you found this post worth reading. If you have any query, please do let me know in the comments below. You can also Subscribe for SolveMyHow newsletter to get exciting hacking, Facebook, Social media tricks right into your INBOX ! Hey there is some problem, I downloaded the fake FB page, create an account in 000webhost.com and have also uploaded all the files but when i reopen the new link of my new website than it shows error that "phisher.facebook" detected so access is forbidden forever to my phisher site...so please please tell me what can i do to hack a FB??? Yeah that's because 000webhost might have removed your Phisher Page or there may be the Problem with the Browser you used ....! Today's browsers are smart enough, they can easily identify the Phisher Pages. First of all to Hack Facebook by breaking its security is next to impossible. They've recruited talented engineers and that's why we can hack facebook with these simple tricks such as phishing page ! For User :- I went to above link, this is totally fake. They'll you to enter the person's ID and they will run some scripts behind which will start Hacking/Stealing you personal Data. Lovely and helpful peace of advise.keep it up. FYI, Facebook is the very secure site, We can only get into people's account by using phishing technique that's why Mark Zuckerberg is the youngest billionaire in the world and guys i went to the above link its FAKE ...! Exactly man. I mean How can one hack Facebook Accounts Officially. This isn't possible anyhow. So, people stay safe from these fake email id's and simply try to hack Facebook accounts by using this phishing technique ! Yeah see Facebook is a very secure site and it is not possible to hack it via some software and the link you visited above is really fake ! These type of sites try to get you personal data by putting you on wait by showing some non-sense messages like "Hacking your Friends Password" While, in actual they're hacking your personal data or they also might try to send some virus to your computer. So, Don't visit such sites ! Looking for a way to Hack A Facebook Account Password Online For Free? Well, I'm happy to announce you that you're at the right place! I can help you here. Just tell me your query. See you can also take it in ethical manner. Like until and unless you won't know the cracking ways, You can't be able to secure anything and you also learned about phishing pages from this post. So, in future you may across such things and you can easily identify it. Hope this answers helps you ! because the post is about the hacking Facebook account through phishing page and yes friend hacking Facebook in official manner is not possible. It's very secure site ! I'm not getting your question. The Link would the same where you have saved your Phishing Page and you do not have to create phishing page. You just have to download it from the link, which I mentioned in the post. Hope this helps you. Do let me know if you any further query. Is the website name the domain name? where does the name of my website show? And the text file is not showing up in the the public folder. I'm not getting your query. Unnat you just have to download the Facebook Phishing Page. Then you have to upload it in any of the web hosting. Just follow the steps I mentioned in the post. anyway can you make a blog about a COMMENT LIKER on facebook?? if you know anything? I'll be very happy for the help. THE COMMENT will be autoliked. also an autolike tool for a SHARED POST, SHARED PHOTO. and autolike in someone else's facebook page. Yes ofcourse. I have written one post in which I have explained how you can get facebook status, pics autolikes. You can check this out. This will really help you in getting 10,000+ autolikes. what to do if you visited facebook password hack and completed the survey. I know its a scam but what should I do now? The phishing technique is not any survey. You just see the similar login web page of the website. If you are trapped. Then I suggest you to quickly change your password. This is the only option. Because the one who had knocked you, had your password in his email. how can i get my blacklink????? tell me details plz..as soon u can.. I'm not getting you can you please be clear. Do you mean backlink ? Can you please exactly tell what's the problem you are seeing on your screen because this thing is really working fine for my other users. Please try again or do let me know the exact problem. Its simple just follow the steps patiently and you will probably hack your friends facebook account. Thanks for stopping by. Rehesya I'm glad you liked the post. Thanks for stopping by. Ashwani which web hosting you are trying is it 000webhost only ? The procedure is same only. You've to create the account and then you have to open file manager. BTW which error you are getting? You can also email them by using there contact us form. Like its really a bug then. Do let me know if you need any help while hacking facebook account. is it still works? fb hack not easy any more. We are not doing anything with fb code. Phishing is the technique we used here.